At Barefoot Surfaces, we aren’t just professionals committed to providing the best epoxy floors in Arizona. We are also dedicated to helping people learn more about these floors and their benefits. We understand that the terminology used to discuss epoxy floors and garage floor coatings in Peoria can be confusing, so we’ve put together a comprehensive glossary for your reference. As always, just call Barefoot Surfaces and talk to one of our friendly professionals if you have questions or if you are unsure about a term or concept not listed here or in Part 1 of our glossary. Epoxy is a synthetic resin that is used in many floor coatings. Epoxy is derived from petroleum products, and a catalyst is used to harden it. Once cured, epoxy is hard and clear, and it provides a solid protective film for floors. Epoxy can be added to other resins to make a harder coating that is more resistant to chemicals and wear. Etching is a process that involves treating a floor with acid to dissolve loose particles that can interfere with adhesion or curing. Etching can also be used to create a profile for the floor. Filler is used to add bulk to a coating or to extend it. Filler includes different materials, and the needs of the job determine the type of filler that is chosen. Gloss is how much shine a floor has. Many like a high-gloss finish for a professional space, while many like a floor with less sheen in a work space. Grit is an abrasive material used to blast a floor or other surface. it can be made from slag or other materials. A coating’s impact resistance tells you how well it can withstand cracking or deformation from a strong blow, such as equipment being dropped on the floor. Coatings with stronger impact resistance are needed for industrial and work spaces. A heavy-bodied coating is described as mastic. When a coating has dried and forms dimples on the surface, it is said to orange peel because the coating resembles the surface of that fruit. Proper preparation of the floor and installation of the coatings will prevent orange peel and other problems. Peeling occurs when the coating or paint comes away from the floor because of poor adhesion. Again, proper preparation and installation are required to prevent peeling. Polyurethane is created by combining polyols and multi-functional isocyanate. The result is a very hard coating that can resist more wear than most other coatings. Portland Cement is made of a mixture of shale, gypsum, limestone and clay. It is mixed with aggregate and water to create concrete. A satin finish has less sheen than a gloss finish. Paints with a satin finish usually have a gloss reading between 10 and 40. Sealer is used just before the final coat in a coating system. The sealer helps to protect the floor and the coatings used below it from damage from chemicals, foot traffic and more. Shot blasting is used to smooth or shape a surface. The process involves blasting small pieces of iron shot or other round material against the surface. Spalling occurs when the surface of concrete begins to wear away, exposing the aggregate. Spalling creates a problem for the adhesion of the floor coating. It must be addressed before the coating system can be applied. Substrate is how contractors refer to the surface that is going to be coated. The concrete floor is the most common substrate. A vapor barrier helps prevent moisture from passing through a material or structure. A vapor barrier is used in the coating system to protect the floors and lower coating layers. 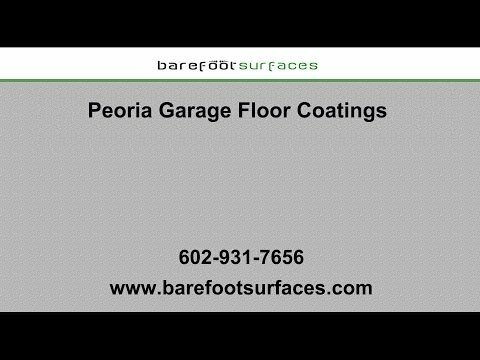 If you have any more questions about epoxy floors or how they work, call Barefoot Surfaces in Arizona to learn more. We remodel work spaces with garage floor coatings and concrete floor finishes in Peoria, both to protect the work space and to improve the value of the property. With patio epoxy coating contractors in Peoria, we can make your space look beautiful and make it easier to maintain at the same time.